". . . an excellent performance of Shostakovichs bleak String Quartet No. 11, with lovely viola solos. . . .Tchaikovskys sextet Souvenir de Florence. . .was splendid. . .full of fire and enthusiasm." Moody Kurt died in April of this year. Our dear friend knew he was lucky to have lived such a long life. 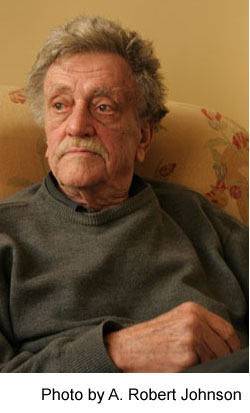 Mr. Vonnegut got a stern dose of patriotism as a draftee serving in the battlefields of Europe during WWII. He was captured by the Germans and incarcerated at Dresden. While there, it was largely destroyed by bombing. Of German heritage, his ancestors had settled three generations prior to his own in Indianapolis, Indiana. They were adherents of an exclusively German social group that espoused pacifist views. Kurt�s ancestors in America kept pretty quiet about being German while WWI was being fought. This background resulted in a life-long examination of internal cultural dichotomies. And there he was, an American draftee being sent to Europe because the Germans who were still living there put everyone on a war footing for the second time in the century. Kurt had a talent for expressing his feelings through the written word. This, with his powers of observation, resulted in a tireless vigil over the comings and goings of people everyone knew could influence the right to life among others of our species. His prolific output of books and articles chronicled the maniacal penchant people have for the use of force in resolving their cultural frictions, usually in the name of patriotism. Kurt Vonnegut was not a self-righteous man, but he was a person at ease with his gifts for observation. The sensation of living life through his eyes had to have been more like Jonathan Swift�s Gulliver, shrieking, �Hello World! Anybody in?! ?� While all he heard was the echo of his own call, many, many people heard both Swift�s and Vonnegut�s cries. We have the satisfaction of knowing how graciously and eloquently they advocated the right to life of all to whom it has been granted, and we have the many examples of Kurt�s good-humored observations. They masked the despair he felt, a despair that will last to eternity when, at the end, his pitiful call for help on our behalf is the last thing heard by anyone. What are the odds that his admonition in a quieter voice may yet be heard: �Above all, be kind.� We must hope. Victor Klemperer was a resident of Dresden when it was bombed. The bombing saved his life because he was about to be removed by the Nazis to a death camp the next morning. The Nazi apparatus was burned with the city. Victor and his wife made their way on foot to safety in Munich. His two-volume account of the war years, I Shall Bear Witness, is an indispensable diary of life in Germany during those times. Quodlibet: "What you will...As you please." Comments? Email us at comments@nyphilomusica.org.